Last week we not only celebrated Halloween like everyone else, but we were also in the Christmas spirit here at the Visitors Bureau! 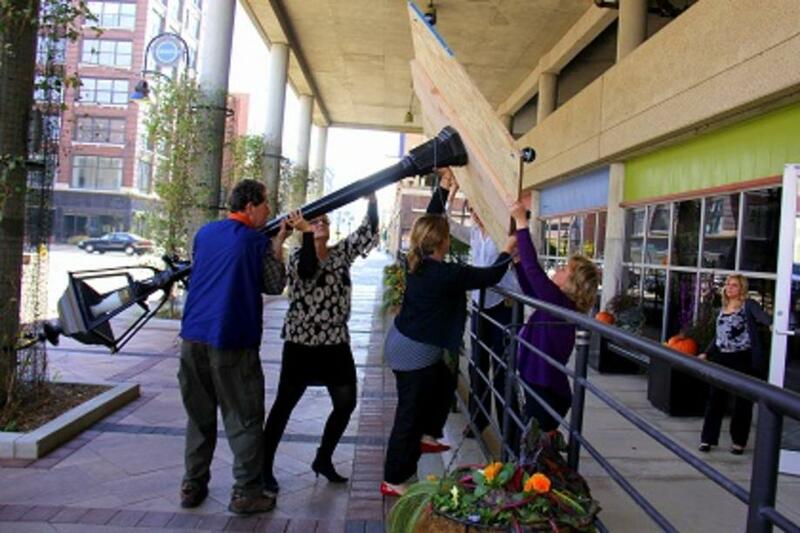 As you may have heard, there is a brand new holiday event called Stroll on State happening on November 30th in downtown Rockford. A press conference was held in our office on Thursday, so the whole back room was decked out in festive holiday decor; complete with a Christmas tree and vintage gas lamp (which was quite the experience trying to get in the building as you can see from the photo!). The morning of the press conference, Christmas music could be heard throughout the office and the smell of cinnamon wafted out of the back room...smelling like Christmas! Once people started trickling in for the press conference, their reactions to the decorations were priceless. There&apos;s just something about holiday decorations that&apos;s magical and makes people feel warm and fuzzy inside. After listening to all the speakers, there was definitely a buzz of excitement throughout the room. I watched people munch on Christmas cookies and drink a cup of "Snowman&apos;s Delight" as they eagerly talked about already planning on going to the event with their families. 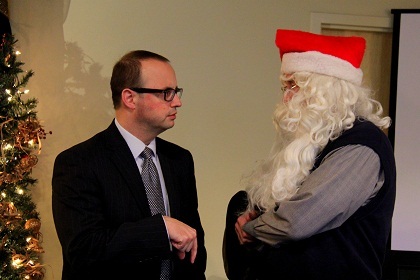 The mayor even was talking with Santa! I&apos;m personally really excited about this event because Christmas is my favorite holiday, and watching everyone else have such a positive reaction to the event made me even more excited! If you haven&apos;t heard about the event, it&apos;s one you are not going to want to miss! Downtown will be transformed into a magical holiday wonderland complete with a 30+ foot tree, ice skating, decorations, shopping, delicious food, Santa, and real reindeer! Rockford will definitely be "Merry and Bright" on November 30th! For more information about Stroll on State, click here.